On this page you will learn about the Set, which is the third basic archery step of the shot sequence. In this step you will learn how too properly hold your hand and position your thumb and fingers on the grip, and how to position your fingers around the bowstring to create the hook. Set your bow hand on the grip so that the grip is placed in the meaty part of the hand just below the thumb. The grip should be located in the web of the hand between the thumb and index finger. Place the thumb so that it is pointing at the target when the bow is raised in the next step. Relax the remaining fingers and gently fold them. The index finger can wrap toward the front of the bow but still it must be relaxed. When the bow is raised, the knuckles on the arrow side of the bow should create an approximate 45 degree angle. The bow hand must stay in place through the entire shot process and remain relaxed even after the bowstring is released. Recurve Bow - the index vane should be pointing away from the riser. In other words, rotate the shaft until the index vane is between your body and the riser. Compound archers will index the arrow differently depending on the type of arrow rest installed on your bow. Gently wrap the first 3 fingers of your bowstring hand (the hand that draws the string back) below the arrow shaft (all 3 fingers go below the arrow for beginners). The string should be located at the first groove of these fingers. Only the top knuckle of the string fingers should form the hook around the string. Mack sure the index finger is pushed up against the nock of the arrow. It is important to keep the back of the drawing hand relaxed and flat. Focus on the position of the bow-hand in relationship to the grip as well as the location of the thumb and fingers. Pay close attention to what you do with the bow hand during the remaining steps of the shot cycle. If you find yourself repositioning your grip during the drawing, anchor, transfer or aiming step then slowly and carefully "let the bowstring down", re-set the position of your bow hand on the grip and begin the process again. The goal is to start with the hand in the same location on the grip and end in that location without adjusting it during any of the next steps. If the location of the bowstring is past the first knuckle then it becomes difficult to smoothly release the string. Hooking too deep on the fingers will introduce additional sideway motion in the string which will prevent the arrow from leaving the string and the arrow rest in a straight path. Locating the string too far out toward the ends of the fingers will strain the muscle, tendons and joint (knuckle) which will lead to pain. Focus on locating the string near the groove of the fingers. Point your thumb down toward the palm of your hand but focus on relaxing the thumb at the same time. New archers have a tendency to "grip the bow". It may have something to do with the name of the part (grip) that we hold. When you wrap your fingers around the grip there is a tendency to "clench down" or grasp the grip in our hand when the bowstring is released. It is a normal, instinctive reaction to "grab the bow" so it does not fall from our hands. In the process of clenching the grip, the riser will twist (torque) or rotate. The problem is, we tend to clench the grip before the arrow shaft has completely left the arrow rest and cleared the riser. The action of clenching the grip will twist or torque the riser in the bow hand and steer the arrow "off course" from our point of aim. Focus on relaxing the fingers and thumb and avoid clenching the grip when the arrow is released. 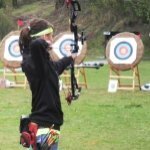 If you are a beginner or advanced archer and you are looking for a personal instructor, coach or trainer you can contact me directly. 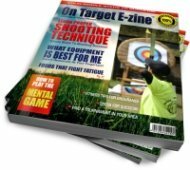 What is the next basic archery step? Do You Have A Question About Set? Your question, experience or feedback will appear on a Web page exactly the way you enter it here. You can wrap a word in square brackets to make it appear bold. For example [my story] would show as my story on the Web page containing your story.